This custom distressed Cabana Bar is structured from Maple with hand-rubbed corners to highlight the natural wood and a glaze overlay for an antique finish. 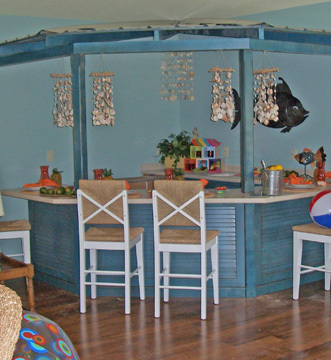 The galvanized metal roof and louvered doors add to the Caribbean feel. Ample storage provides for bar necessities. This piece was built with a solid surface countertop. Rich tropical hard woods are another option to carry out the Caribbean mood.